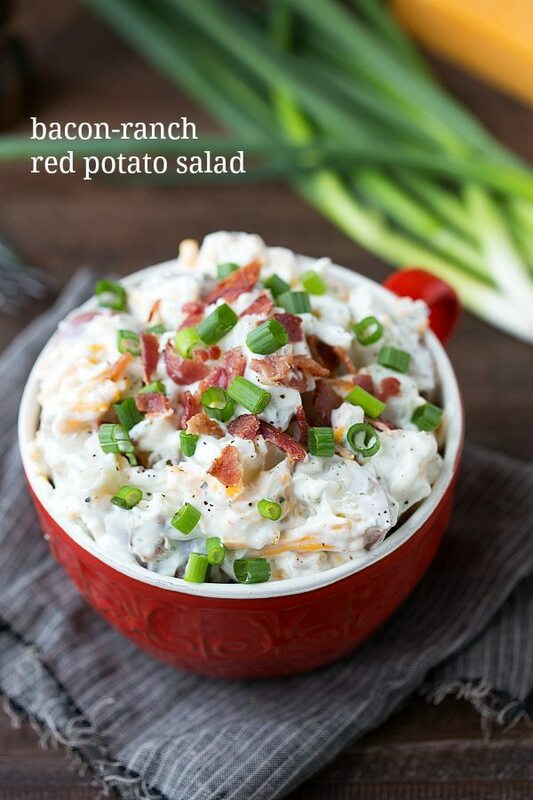 A quick and simple ranch flavored red potato salad with bacon and cheddar cheese. We thought it would be fun to try Moab again, just the two of us. So we are leaving the little guy with grandparents for the weekend and heading up early Saturday. I’m pretty sure I’m going to have major baby withdrawals, but am super excited nonetheless. Moab is one of my very favorite places to hike and camp at, and it will be good for the little guy to spend time with his grandparents and his three aunts (my little sisters) that are all so crazy about him. There are minimal ingredients and not too many steps which makes for a great summer recipe! The one important, but slightly annoying step, is the need for this salad to chill. It needs a good 2 hours for all the flavors to really meld together and to get it to the right temperature where it tastes divine. Other than that everything is pretty straight-forward. Get ready to be the hit of your next BBQ party with this one! Leave the peel on the red potatoes and cube them into pieces. Put all of the potato cubes in a large pot and cover with about 1 inch of water. Add some salt to the water and put the pot on the stovetop. Allow the potatoes to come to a boil on high heat and then reduce the heat to medium low and cover. Allow to simmer for 15-20 minutes or until the potatoes are tender when pierced with a fork. Drain the potatoes and run under cold water until they have completely cooled off. Meanwhile, mix the ranch dressing packet with the sour cream. Start by mixing only 1/2-3/4ths of the package and then add more depending on personal taste preference. Cook the bacon, drain the fat, and crumble. Mix together the cooked potatoes and bacon, the shredded cheddar cheese, and sliced green onions if desired. Stir in the sour cream and ranch dressing mix. Add in pepper to taste. Chill, covered, in the fridge for at least 2 hours prior to serving. 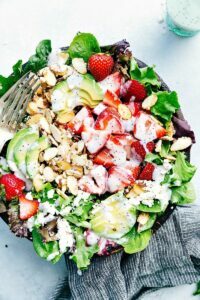 I love this salad! It looks so creamy and yummy! oh yum! 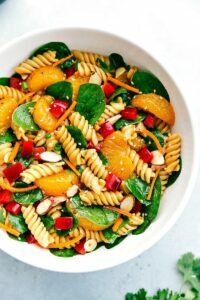 this salad would be a perfect side this summer! You had me at bacon and ranch, Chelsea! 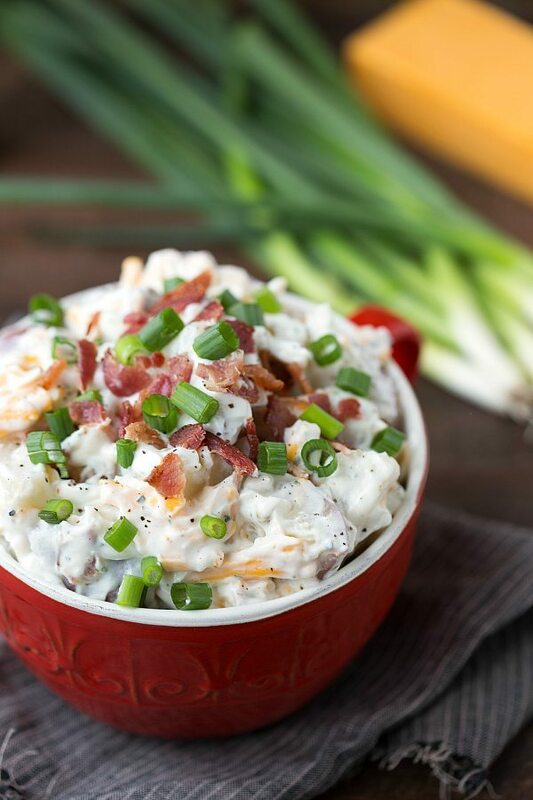 This potato salad looks fantastic! I love the flavors and how creamy it looks. So perfect for this time of year! Pinned! 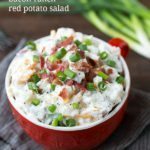 Bacon and ranch mixed with potato salad is epic. This looks so good. This potato salad looks fantastic, Chelsea! Love! the ranch flavors going on in here! This sounds like the perfect side dish for all those summer parties and bbq’s! It looks so creamy! I love the bacon and cheddar cheese. It’s so delicious and yummy! And very quick to make.